The Advancing Human Rights initiative is a research project to document the landscape of foundation funding for human rights and track changes in its scale and priorities. It uses grants data to map the human rights issues addressed, funding strategies used, and populations and regions served. For those considering human rights-related grantmaking for the first time, this website offers an introduction to the field. Where Do Human Rights Grants Go? Human rights grantmaking empowers individuals, communities, and institutions to promote the protection and enjoyment of rights, including those enshrined in the Universal Declaration of Human Rights and subsequent human rights treaties. What Do Human Rights Grants Support? To advance human rights, we must start at the roots of social issues and inequality and work to change unjust structures and systems. Who is the Focus of Human Rights Grants? Human rights are intrinsic and belong to everyone. There are no exceptions based on religion, caste, gender, class, sexuality, geographic location or any other factor. They are interconnected, indivisible and intersectional. What Strategies Do Human Rights Grants Support? It is hopeful and inspiring to not only see people rising up and demanding their own rights, but going beyond their immediate needs to look systematically at how what they are fighting for is tied to what others are fighting for elsewhere. What is the Advancing Human Rights initiative? 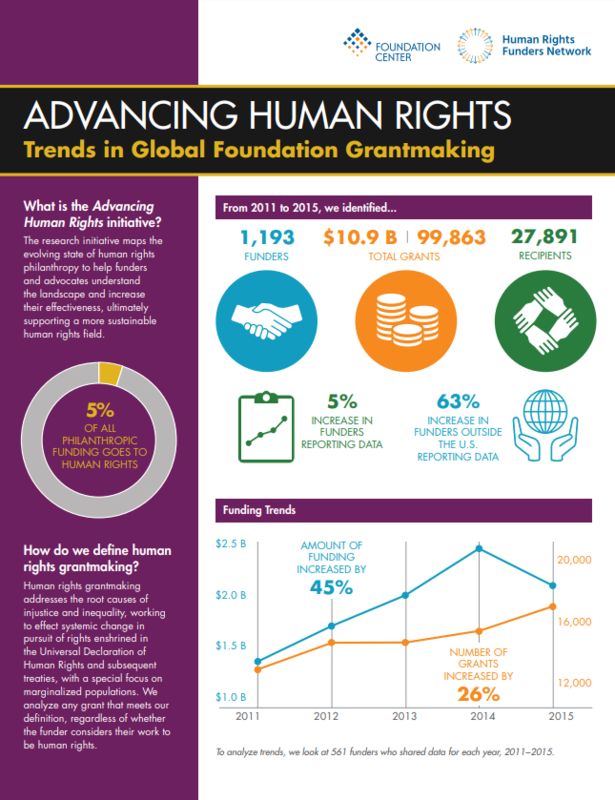 How is human rights grantmaking defined? How do we track human rights funding from foundations? The Advancing Human Rights initiative tracks the evolving state of global human rights funding. It is a collaboration between Foundation Center and Human Rights Funders Network, in partnership with Ariadne and Prospera. Our aim is to strengthen funders’ decision-making, promote collaborations, and improve the effectiveness of human rights philanthropy.